Ebola is spreading in Sierra Leone’s northern districts of Port Loko and Bombali, where there are currently no Ebola Treatment Centers. To no surprise, these two districts are now the country’s worst-effected. A 17-year-old survivor from the town of Lunsar in Port Loko says it took three days for one of the district’s overwhelmed ambulances to arrive after she called for help. She told International Medical Corps counselors that her condition worsened as she waited among her frightened younger siblings and the bodies of their parents, whose lives were taken by the disease days earlier. She was eventually packed into a van with others stricken with the virus and taken to the closest Ebola Treatment Center for care, nearly five hours away in the town of Bo. The vast majority of the infected in Port Loko seek help at overrun local hospitals that lack the training, supplies and safety protocols to properly care for the influx. More and more, the sick stay at home to be looked after by family members and die among them, all too often spreading the virus to loved ones in the process. 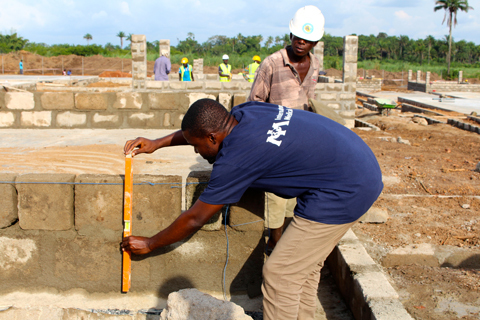 International Medical Corps is constructing two Ebola Treatment Centers, the first to open in Lunsar in late November, and the second in the city of Makeni in Bombali, to open in mid-December. They will be the first such centers in the devastated north of the country. Doctors, nurses, chlorine sprayers, cleaners, counselors, ambulance workers and others, mostly from Port Loko and Bombali Districts, are being actively recruited and trained. In all, some 250 people are expected to work at each site until the disease is contained. International Medical Corps also expects to break ground in the weeks ahead on a dedicated and formal training center in Lunsar for health care providers, water and sanitation workers, counselors and midwives. The curriculum will include infection control protocols, clinical care for Ebola, nutritional needs, use of personal protective equipment, psychological first aid and psychosocial support. “You are the first coming to help us and everyone here must be on board to fight this together,” said Koblo Queen II, Paramount Chief of Marampa Chiefdom in Port Loko District, at a community gathering this week with International Medical Corps’ Emergency Response Team.